Do plants really move? Absolutely! You might be surprised by all ways plants can move. Plants might not pick up their roots and walk away, but they definitely don't sit still! Discover the many ways plants (and their seeds) move. Whether it's a sunflower, a Venus flytrap, or an exotic plant like an exploding cucumber, this fascinating picture book shows just how excitingly active plants really are. "A new way to see the plants around us." Best Science and Nature Books from School Library Journal's "Fuse #8 Production"
Double-page spreads of watercolor and collage use minimal words to describe how and why plants move. "Plants don’t have feet or fins or wings, yet they can move in many ways. / Look closely and you’ll discover that plants can’t sit still.” These words dance across two pages loaded with images of several kinds of plants in different stages of their lives: seeds, vines, flowers, fruits. Colorful, exuberant illustrations work impressively with the text to prove that plants—in every stage—move in order to find and acquire uniform needs: “water, sunshine, and room to grow.” Throughout, readers are treated to a plethora of words more often used for fauna than flora, such as “wiggle” and “squirm.” Nighttime images show bean leaves “nodding” and tulip flowers “folding,” while moon flowers “wake with the stars.” One sentence is momentarily startling to adults with fixed definitions: “A seed is a plant built for travel.” However, the pages that follow easily support that statement, as different kinds of seeds depart from parent plants, travel, and grow into seedlings. The resources at the end of the book are as well-planned and carefully executed as the rest, offering information—including names and descriptions of every plant in the book—that expands the interest level of the text from preschool into early elementary. In comparison to animals, plants seem rooted in one place, but that doesn’t mean they’re not in motion. Underground, their roots slither along, searching for water and sometimes sending up new shoots. Seedlings push through the soil, unfurl their leaves, and grow toward the sun. Some leaves shrink when they sense vibrations, while others snap shut to catch a fly. Seeds can be long-distance travelers, from small, light ones that whirl and glide through the air to a large one that floats across oceans. With a doctorate in biology, Hirsch understands her subject, but equally important is her ability to communicate with well-chosen words that make the ideas fun and memorable for children. While some may be content with the main text alone, others will be fascinated by appended descriptions of a squirting cucumber shooting its seeds or the raspberry seed riding through a bear’s digestive system. Posada’s impressive artwork, created with cut-paper collage and watercolors, illustrates the ideas clearly while creating varied, often lovely effects with colors and textures. Back matter fully supports the picture-book text with additional information on each of the plants featured, but not named, in the main section. A new way to see the plants around us. This wonderful book teaches about all the ways that plants move—from various modes of seed dispersal to subtle movements, such as growing taller or closing up flowers at night. It encourages children to look at plants in a new way and pay attention to all the details that tell us about how plants move and transport themselves. Indeed, plants fly, swim, hide, eat bugs, ride inside bears, and more! A section at the end includes detailed descriptions of each plant depicted in the book, explaining more about its natural history and how and why it moves. The watercolor illustrations show plenty of plant action to help readers know what to look for in their parks, backyards, and gardens. Focusing on an aspect of plant life that not many consider, this title examines the ways in which plants move: sunflowers turning toward the sun, a snapping Venus flytrap, and seeds hitching a ride downriver. Hirsch uses simple verbs (e.g., wiggle, reach, unfold) to explore a characteristic or trait of plants (specifically their need to seek out “water, sunshine, and room to grow”), leading up to the refrain “plants can’t sit still.” Each verb is given a different color from the main text, adding the benefit of text awareness and vocabulary to the title. Illustrator Posada artfully uses cut-paper collage and watercolor to depict, for instance, roots searching underground for water, flowers growing upward on a trellis, winged seeds gliding in the air, and tulips closing up at night. Back matter identifies and provides further information on the flora found throughout. VERDICT The bright illustrations and the simple but moving text make this a solid addition to any collection looking to inspire interest in the natural world. Plants Can’t Sit Still is a delightfully creative look at a characteristic of plants which is often overlooked…their movement. Plants can move. Blossoms grow toward the sun. Roots snake along the ground. Many plants react to their environment. Some flowers fold up for the night. Some fold up when touched. The author also highlights plants which move in more unusual ways, like the tumbleweed and the squirting cucumber. Lastly, the text explores how plants travel: their seeds floating, flying, hitchhiking, and whirling through the air. From cockleburs to coconuts, seeds are designed to travel to new places where conditions are good for growing new plants. The back matter contains a more detailed summary of plant behavior. 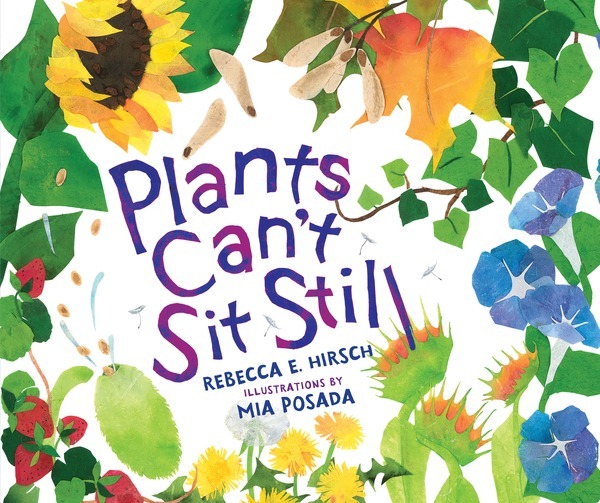 Along with a glossary, descriptions of each species, and an author’s note explaining how she researched the plants in the book, Rebecca Hirsch includes recommended reading, and links to Venus fly trap videos and accelerated growth footage. Mia Posada’s art is perfectly suited to the text. The illustrated plants climb, slither, and squirm their way across the pages in earthy watercolor collages. Plants Can’t Sit Still is beautifully written, using active verbs and energetic fonts. The ending circles back to wording from the beginning, mimicking the plant life cycle. The text is lyrical and the author avoids rhyme in favor of vigorous prose, inviting readers themselves to move, through the pages and back again.